Overton County Horseman's Association (OCHA) is a Saddle Club geared towards clean family fun. 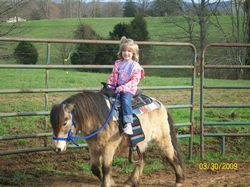 OCHA is part of the Tennessee Saddle Clubs Association (TSCA). OCHA is located at the Overton County Fairgrounds in Livingston TN. Membership is $30.00 a year for single or family. There is an additional $5.00 fee for each Friday night that you ride to help pay for maintence. Where else can the family go and have fun for $5.00? OCHA 2012 Show Season begins Friday April 13th, 2012 at 7:00 pm at the Overton County Fairgrounds. The 1st and 3rd Friday night of each month will be Judged Events and 2nd and 4th Friday night of each month will be Speed Events. TSCA points will end on August 10th, points for year end awards will continue until September 28, 2012.